Wilson Golf is a division of Amer Sports, one of the world's leading manufacturers of sporting equipment. They will celebrate their 100th anniversary in 2014. Wilson ) designs, manufactures and distributes golf equipment worldwide. Some of the leading golfers use Wilson irons, Wilson golf bags, and Wilson golf balls. Many of their irons feature a thinner topline and progressive offset for a confidence-inspiring look from address. The cavity exoskeleton places more weight in the heel and toe. This weight ratio increases stability, while maintaining the center of gravity behind the sweet spot. Many golfers praise the great feel and power of Wilson irons. 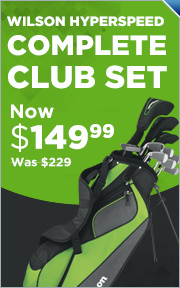 Global Golf is committed to bringing consumers Wilson golf clubs (including Wilson golf club sets), balls, bags and accessories at a tremendous value. Our inventory of new and used Wilson golf clubs changes on a daily basis, so check back often for our most current inventory.